From 2nd til the 9th of November Stuart, Blake and I headed off on our long awaited holiday to Cape Verde. 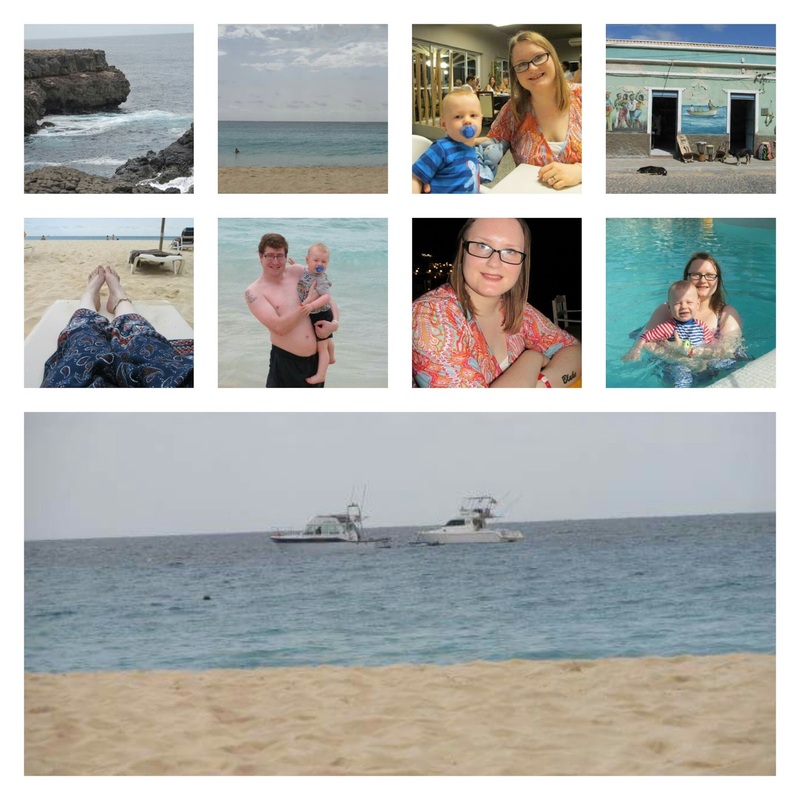 For those of you that don't know where Cape Verde is, Cape Verde is made up of 10 little islands in the Atlantic Ocean, 500 kilometres off the coast of Senegal.We went to the little Island of Sal and stayed at a lovely hotel in Santa Maria. We had such a lovely and relaxed time and spent most of our days relaxing by one of the 3 pools, swimming or on the beach. We did venture out of the hotel on a few occasions to find some shops and also when we went on some excursions with Thomas Cook. I was sent an e-book on West Africa and things we could get up to in Cape Verde by the people at Lonely Planet which was so helpful on what to expect and things you can do over there. I would definitely check out their travel guides if you are going away somewhere soon. The hotel that we stayed at was The Belorizonte Oasis and we stayed in a lovely bungalow. The bungalow was a great size for the 3 of us, clean and perfectly kept. We had the room made up every day and we had no issues with our room at all. The hotel has three restaurants there is the main buffet restaurant where all meals are provided and the other two are where you can book for a 3 course set menu. The main buffet restaurant had a great selection of food. Some days where better than others and I found lunches tended to be personally more better than the evening meals. The pre bookable restaurants with the set menu were amazing. There was one that was a restaurant on Santa Maria beach where the food was fish dishes (apart from dessert, which was a chocolate cake) the other was set on in the hotel and was my favorite meal from the whole holiday with pumpkin soup to start, 2 mains which were salmon and chicken and then a delicious creamy dessert. Food wise there was also a great selection of snacks in the morning and afternoon and we also chose to do an excursion which was a candlelight BBQ on a beach with entertainment including dancers and a fire eater. We had such a lovely time and Blake really enjoyed it too. Santa Maria beach was amazing and Blake had a wail of a time playing in the sand, throwing it at us and covering our feet. It was lovely to see Blake having such a lovely time even though he most likely wont remember the holiday since he is so little. We got to swim in two of the 3 swimming pools and as Blake is such a water baby he loved it so much he started to undress one day as he was eager to get in. On our last day of the holiday we took a tour in a mini bus of the whole island. Blake was such a good boy and we got to enjoy the whole island and see and photograph some amazing sites. The photo below is of inside a volcano which was truly amazing. So overall we had such an amazing holiday and have come home feeling refreshed and revitalised. We are so proud of Blake with being so good on the 6 hour flight too and lots of people commented on how they didn't realise a baby was on the plane. It's great that Blake is such a good little traveller. I think it's a shame many parents stop travelling, as they are worried their baby/child will misbehave. Sounds like you all had a wonderful time. All inclusive packages are the best option if mummy is to have a break - with the cleaning and cooking sorted! The landscape seems really cool. I've never been there and it looks like a fantastic place to visit! Oh my goodness it looks like you had such an amazing time, I would love to go on a winter getaway myself. Thats great that he got on ok with the flight :) I have an 8 hour flight to Mexico soon.....eeeeek! Looks like you guys had a fantastic holiday! It looks so idyllic and beautiful, my brother went last year and loved it. Ooh I fancy taking a holiday to Cape Verde. I'm so glad you had a lovely time & Blake was so good on that 6 hour flight bless him. Good you guys had an amazing holiday. Looking forward to mine. Cape Verde looks so pretty! I hope I get to visit one day. Isn't it lovely when the children are really good and you get to enjoy everything? glad that you had a lovely time :) will you go there again when blake is older? No 572 looks great, as does the golden sands and a 6 hour flight seems reasonable too. Might have to add this to my list of places to visit. Cape Verde looks lovely. I really love the picture inside the volcano!! So great to hear that you had a wonderful holiday. It looks like fun!